Just popping in to add a freebie for your Math Work Stations for March. I hope everyone is doing well and getting lots of new ideas for March. We are gearing up for our Dr. Seuss celebration and I'm loving all the great ideas I've seen on everyone's blogs and through Pinterest. I have way more resources accumulated that I'll ever be able to use and I'm loving that! I'm working on several St. Patrick's Day activities and stations that I hope to be posting soon! 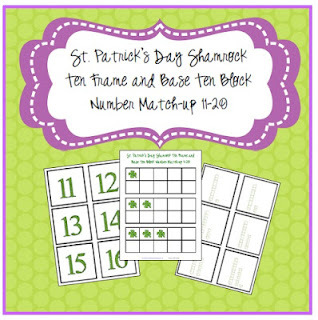 For now, click on the picture below to download your St. Patrick's Day Shamrock Ten Frame and Base Ten Block Number Match-up freebie! Love this!Thanks for creating and sharing. Thank you for sharing! This will be perfect for March centers! Thank you so much for always sharing. This would make a great center. As always, great job! Fabulous math station! Thank you for sharing such cute things that are ready to use! As always, you rock! SMILING now! Thanks for the awesome freebie!!!! I am one lucky girl...thanks for sharing! Thanks to you for sharing with us! Thank you so much for posting this amazing freebie! I used most of the activities in my class! Thank you soooo much! Loved it! 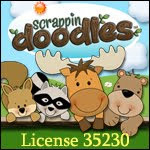 Also purchased your Lady/Chick unit on TPT and am using many of those activities you made! Thanks for all you do! Love your products and freebies! Thank you so much for commenting! I'm thrilled that you used the activities. I LOVE posting freebies! Thank you for purchasing my There Was an Old Lady Who Swallowed a Chick unit, too. I appreciate you taking the time to come back and comment! :) You made my day!